TORRANCE, CA – Edelbrock is excited to announce the release of their E-Force Supercharger system for 2005-10 Challenger, Charger, Magnum and 300C equipped with a 6.1L HEMI engine (#1536). This new supercharger system will produce 556 horsepower and 501 ft-lbs. of torque with low boost on a stock engine. This design is engineered and manufactured by Edelbrock and features an Eaton® Twin Vortices Series (TVS®) 2300 GEN VI rotor assembly – the same internals used on the Corvette ZR-1. The supercharger assembly is integrated into Edelbrock’s unique intake manifold for a truly seamless design with minimal components. The intake features 7″ long runners for maximum low-end torque and an integrated bypass valve that helps reduce parasitic loss under light throttle, which improves gas mileage potential. Keeping the air cool is a 110 square inch, high capacity, air to water intercooler and a full face, low temp, heat exchanger. It has been designed to meet 50-State emissions and work with all OEM emissions equipment (E.O. Number Pending). 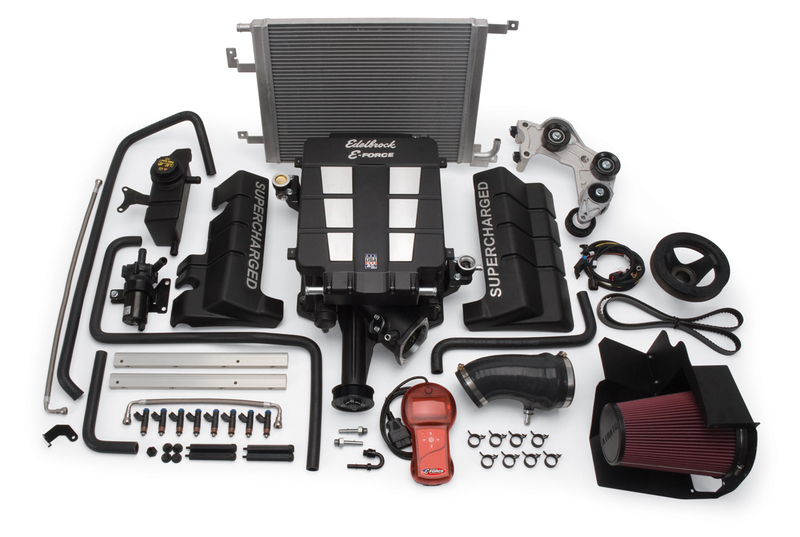 This complete Edelbrock E-Force supercharger system includes everything you need to bolt it on under the hood, including supercharger/manifold assembly, cold air intake, fuel injectors, air-to-water intercooler and a handheld flash programmer to properly tune the factory ECU for the added power. Edelbrock offers 2 levels of optional powertrain warranty terms – including 3-Year/36,000 mile and 5-Year/100,000 mile, offering up to $19,000 of coverage, for peace of mind when installing on a brand new car. Edelbrock also offers a competition version of this system (#1537). Edelbrock E-Force Competition Supercharger systems are based off of our popular street systems, but are pared down to the essential components that a racer needs, without the extras that experienced racers prefer to customize for their own competitive advantage. They include the essential supercharger package components with selectable options based on your purpose built needs – from fuel injectors, pulleys and much more. See the systems in the Supercharger Superstore here.